Steve and Russ were two of Keith’s roommates when we were at the Navy’s training facility in New York. Although our paths diverged quite a bit afterwards, it was an intense time in our lives and the friendship that really got its roots there has continued and deepened through the years. 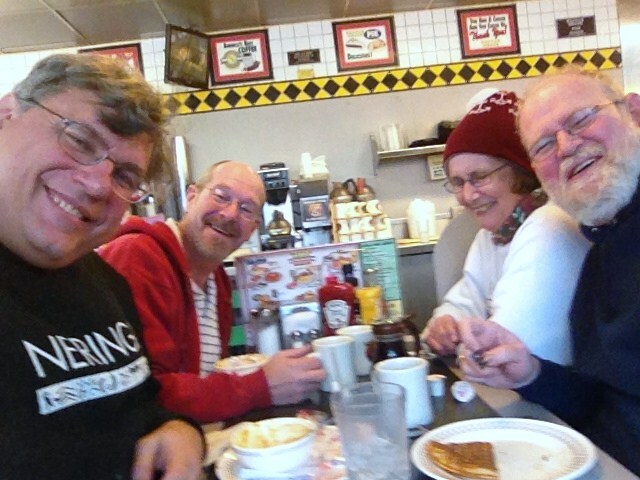 At least once per year, we try to get together and visit with each other and to play tourist somewhere. For point of reference, Betty and Keith met while Steve, Russ and he were roommates. 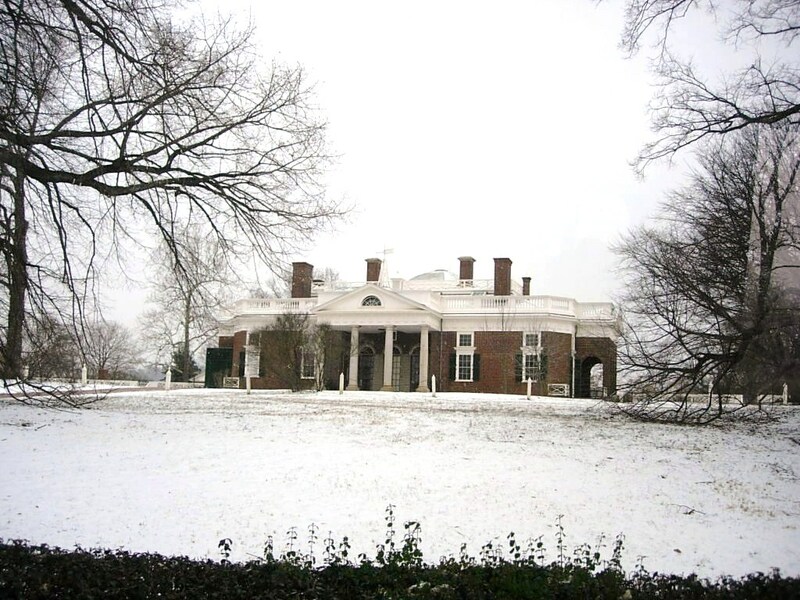 On January 24, the website for Thomas Jefferson’s home in the hills near Charlottesville VA indicated that they had closed early due to the inclement weather but to check back for the schedule for the next day. 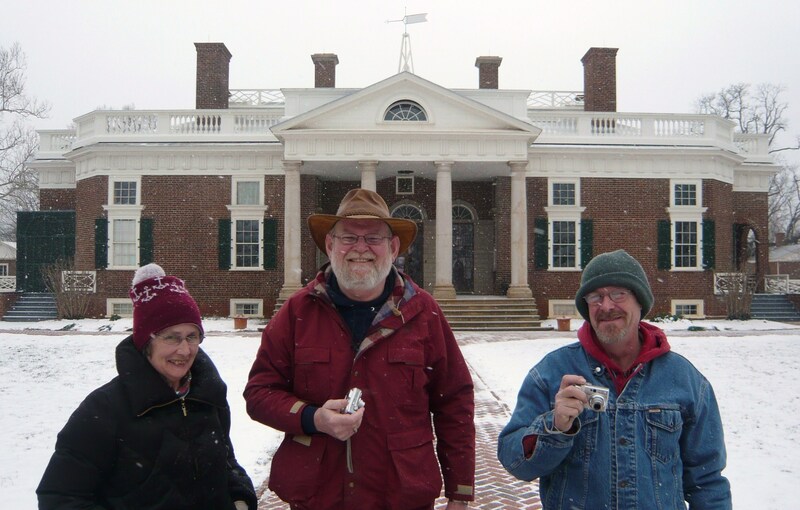 At sometime after 9:00 am on Friday, January 25 the website indicated they would be open normal hours so we loaded up with hopes of seeing Monticello and maybe even Monroe’s Ash Lawn and Madison’s Montpelier. 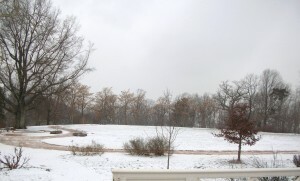 The forecast was calling for the possibility of light snow in the early evening. Not in any particular hurry to get there, we meandered a bit and considered getting lunch on the way but decided to wait until after our tour and pulled into the nearly deserted parking lot about 1:00. 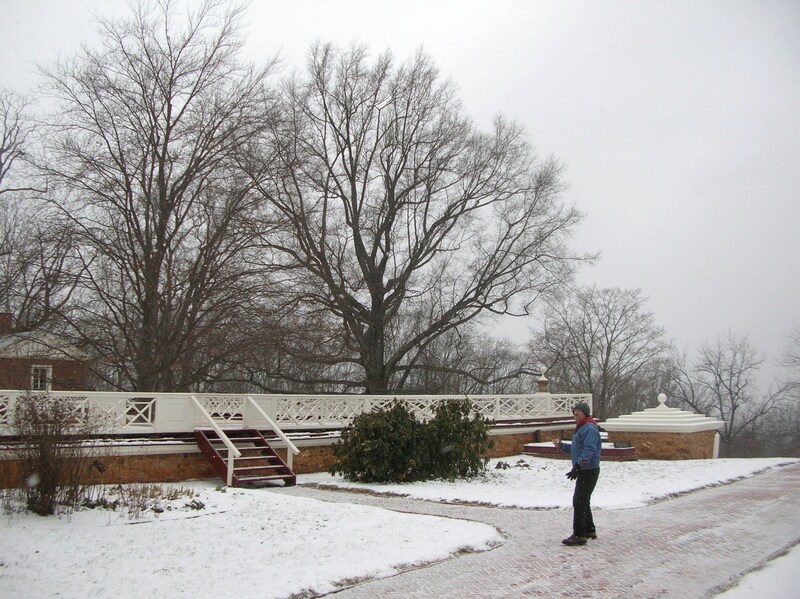 It appears the flurries and cold had discouraged many less hearty souls from the hilltop this afternoon. We went inside the cluster of buildings and bought our tickets for the 1:30 tour. After we purchased our tickets, we were told that would be the last tour this day as they would be closing early today because of the weather. 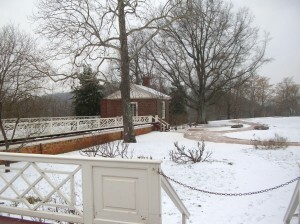 When I had last toured Monticello (a time best measured as a couple of decades rather than a specific number of years), tickets were purchased at booths similar to those seen at a fair rather than the complex of steel and cedar with brick walkways. Since our tour was departing soon, we decided to skip past the gift shop and theater but went into the museum to await the shuttle. 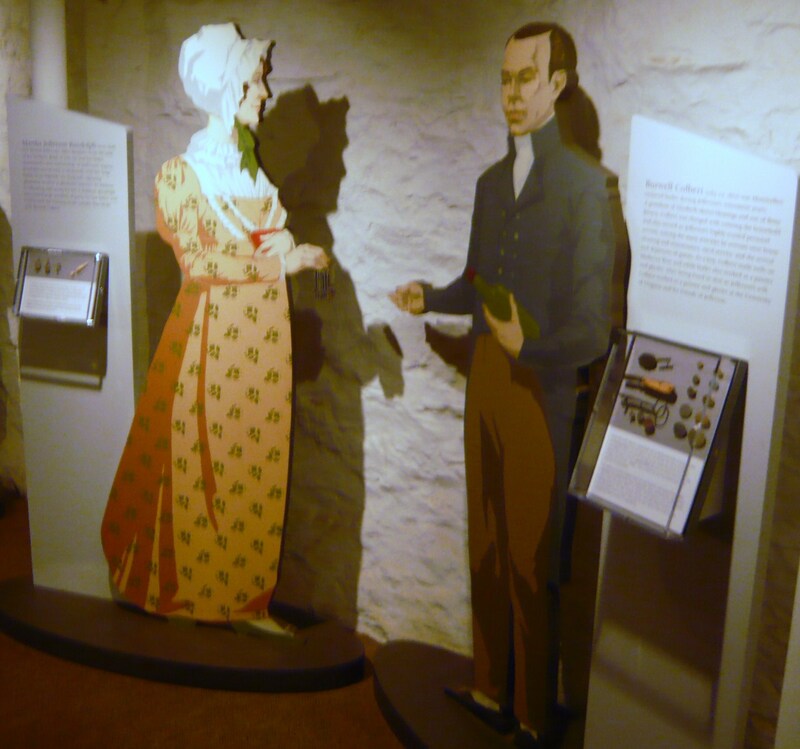 The museum exhibit was themed more around the lives and times of the others living at Monticello, including the slaves of his era and later occupants. 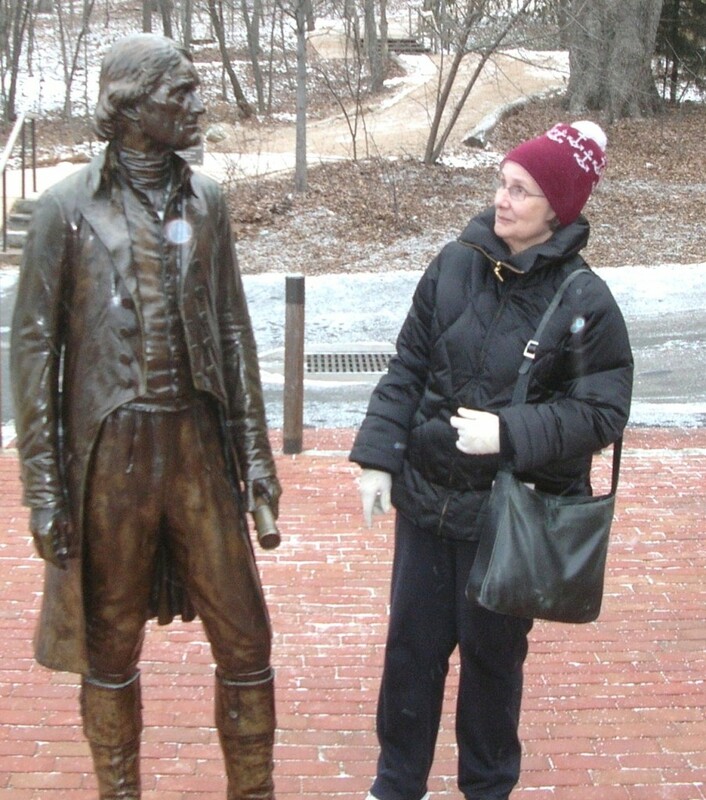 Outside the museum was a life-sized bronze statue of our third President and we all took the time to speak with him one-on-one. We boarded the bus and Jefferson watched us head up the hill. 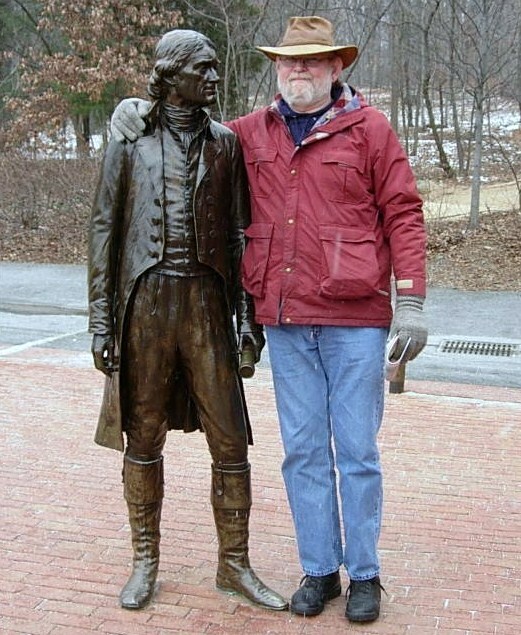 He’d be there when we returned. 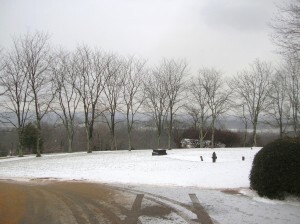 We rode in the shuttle bus up to the main house and you could feel it getting colder and the snow flurries came more frequently. The low square structure at the corner is a cistern for saving rainwater. 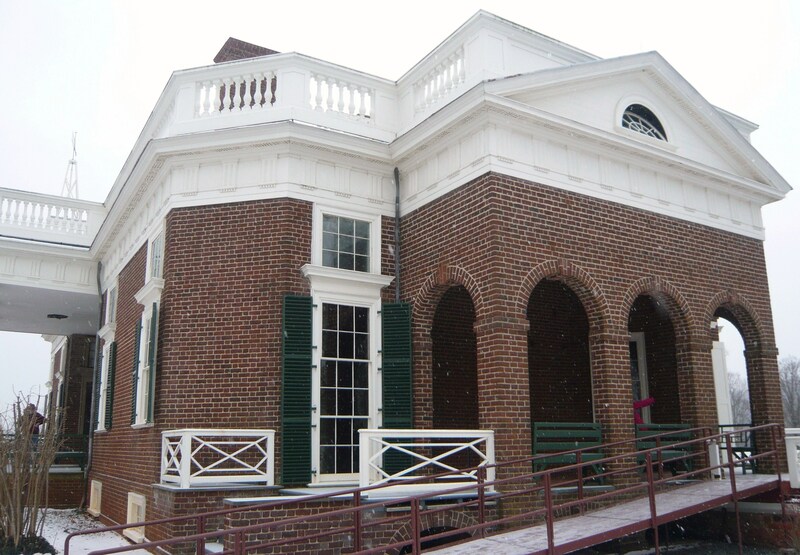 Jefferson’s library and personal quarters from the outside. 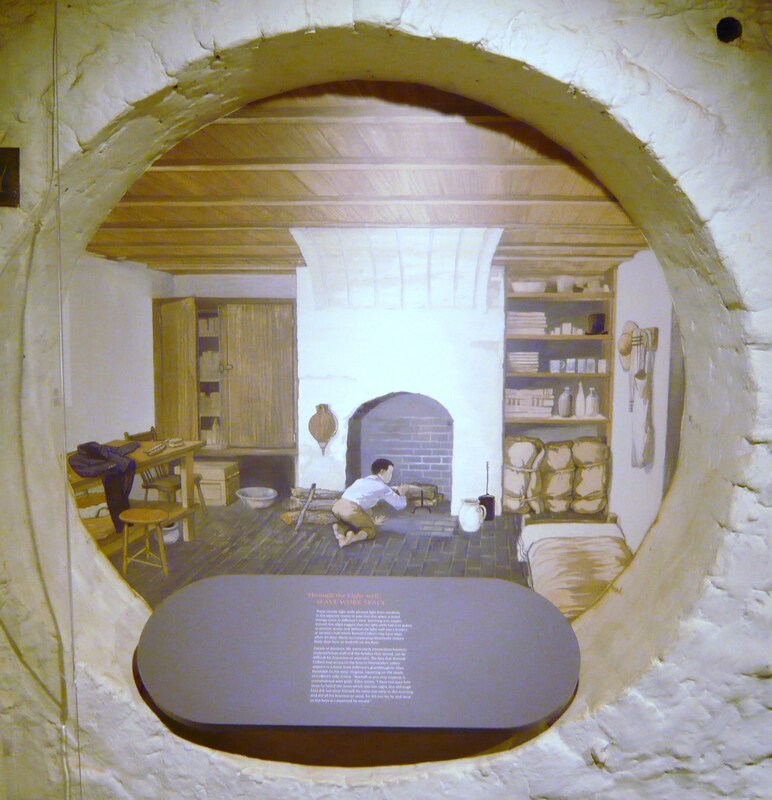 The openings along the ground under the floor level allowed for warming fires to support the plants he grew. Guest rooms occupied the rooms to the left in this picture and a tea room was to the right (rear). 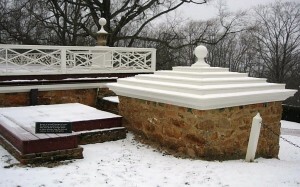 While Jefferson was ahead of his time in many regards, the accessible ramp is a more recent addition. 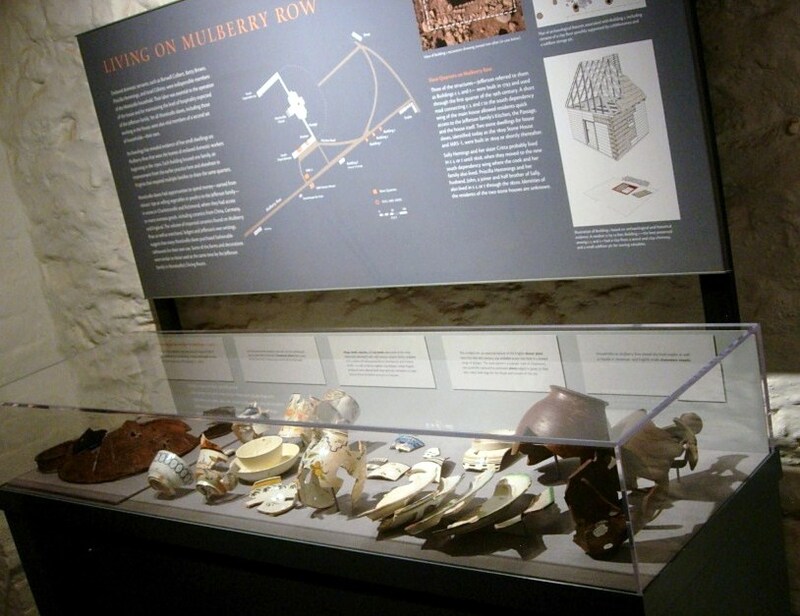 Our tour began on the first floor inside but the cameras had to be put away there due to copyright and ownership issues on some of the loaned display items. I suggest you visit the website here where more detailed discussions and pictures can be found. 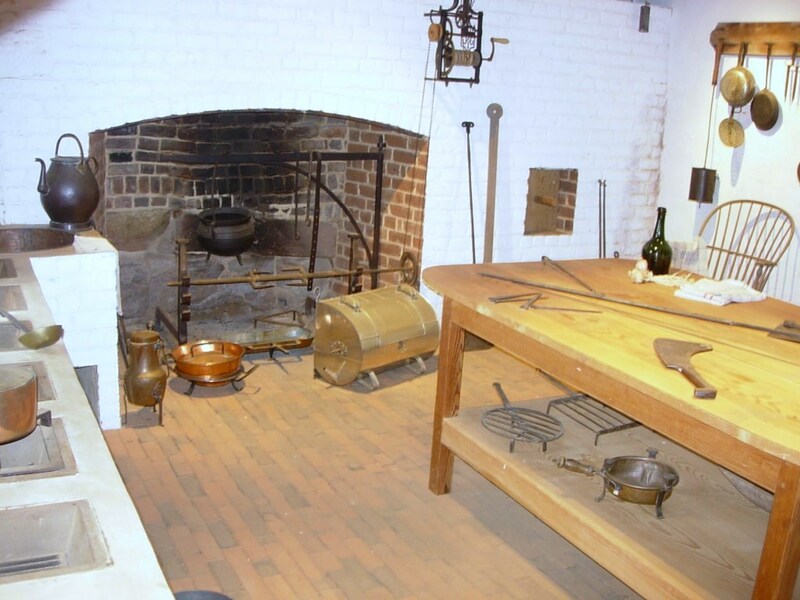 The first room we visited was the main entry which included a view of the large one-week clock which Jefferson had built as well as artifacts from the Lewis and Clark Expedition into the Louisiana Purchase. 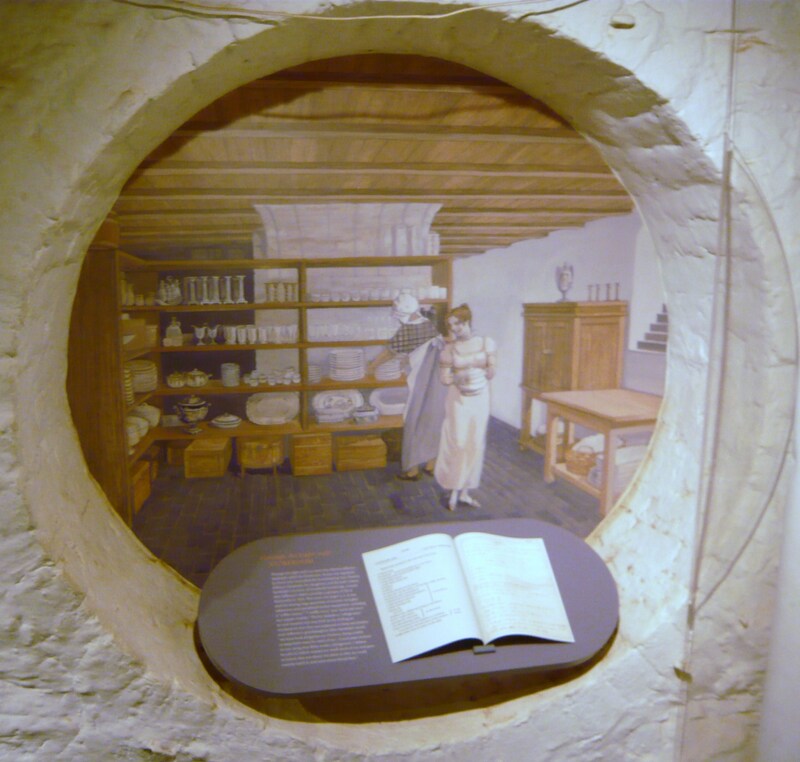 We moved into the family’s quarters seeing Jefferson’s library and hothouse which was heated in part by fires under the brick floor. We curved across the backside of the house and into the dining area with bright paint which seemed a cross between sunflowers and marigolds. 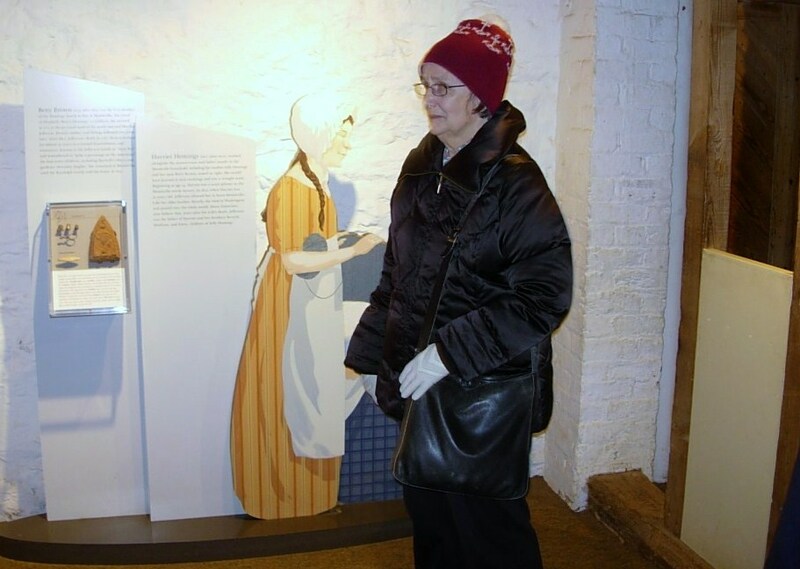 Continuing around to the opposite front corner of the house, we viewed a guestroom and then moved down a narrow stairway to what would be service areas of the house, generally used by the servants and working folks rather than house guests. 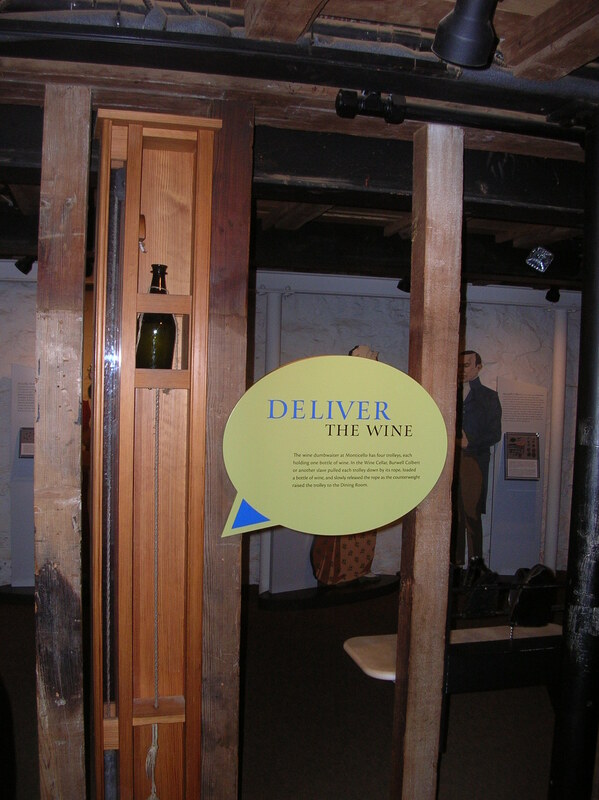 This bottle-sized dumb waiter allowed sending wine directly from the wine cellar to the butler’s pantry off the dining room. 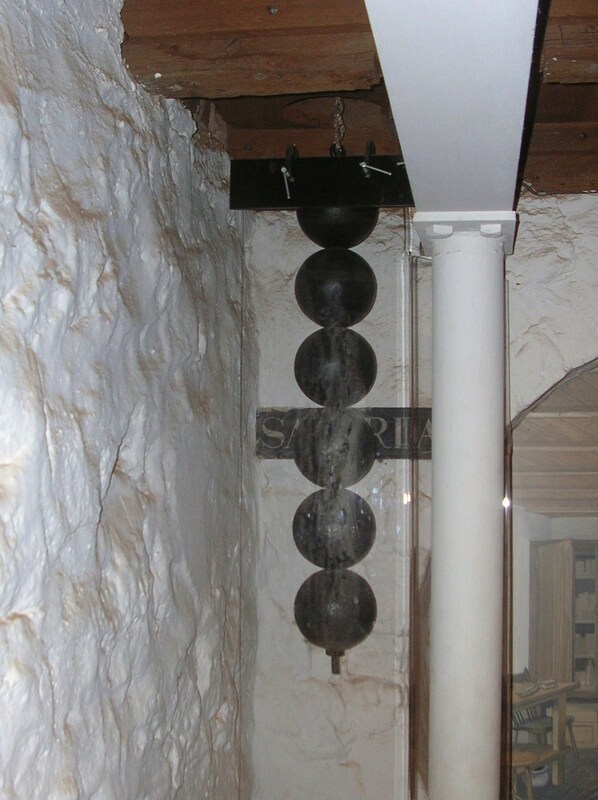 The 7 day clock upstairs is operated by these weights but the length is too much to be fully contained on one floor so the end of the weights goes into the cellar. 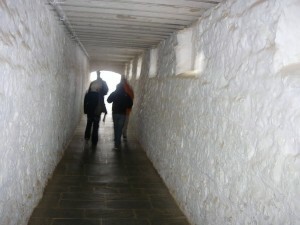 This passage leads from the cellar south to the outside. One of the cisterns. 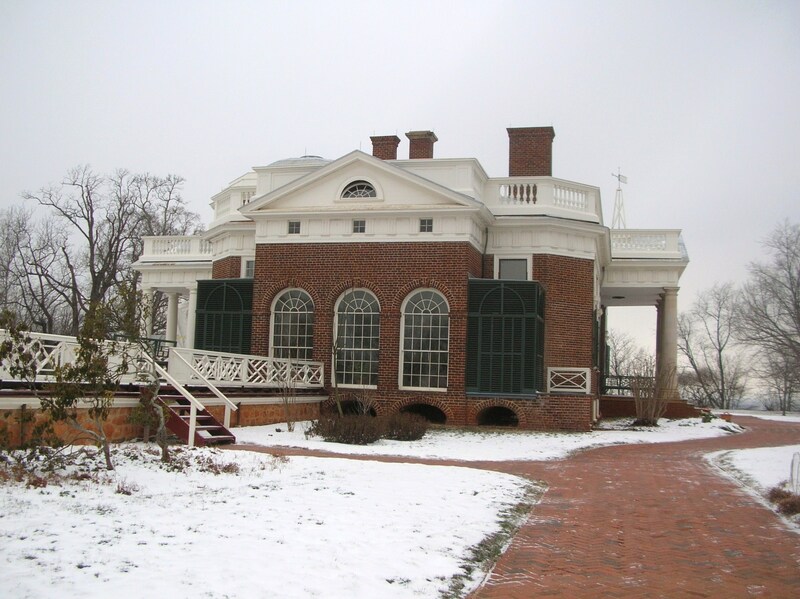 Because of periodic shortages of water, Mr. Jefferson installed 4 at strategic locations to catch rainwater from the house and walkways. 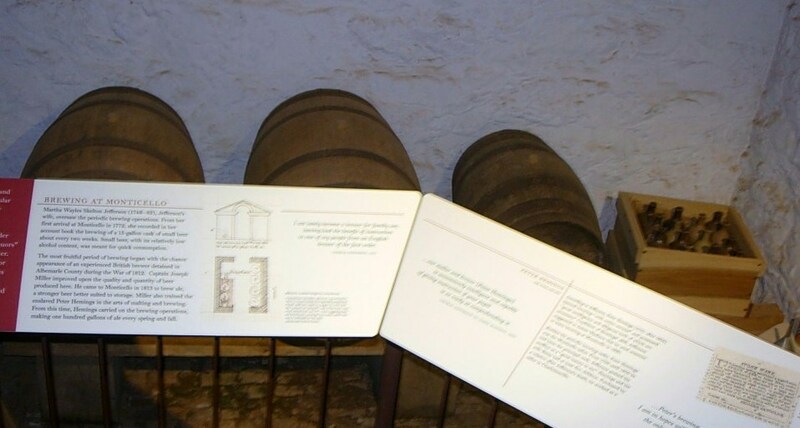 Each of the four potentially held 3,800 gallons. 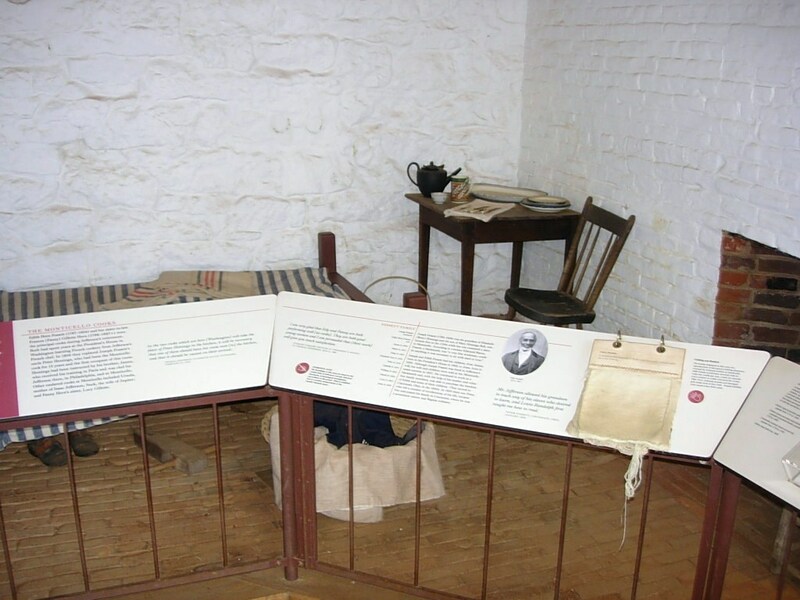 These were single rooms that were used as a study or quiet place by Jefferson and his guests. 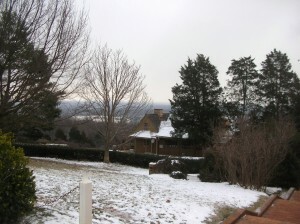 The more famous views of the house were actually the back. 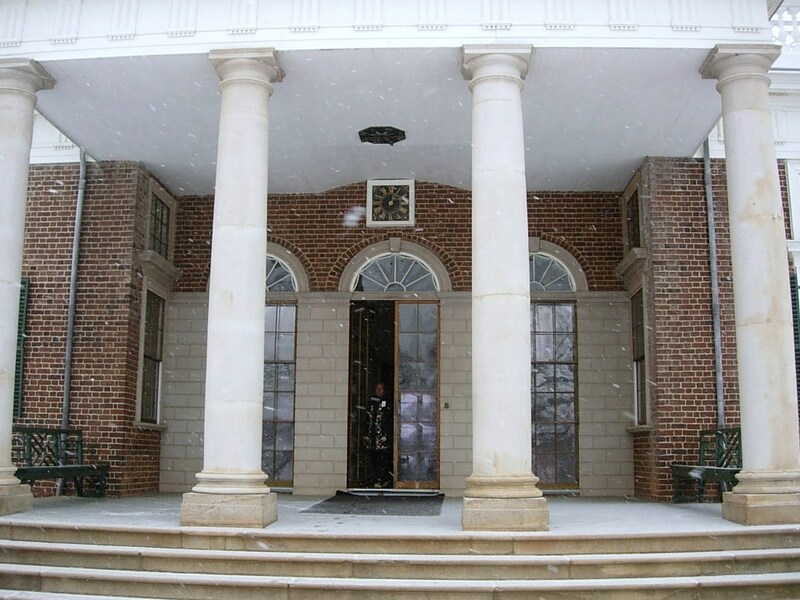 The white sheeting covering the columns is to protect renovation/restoration work in progress. 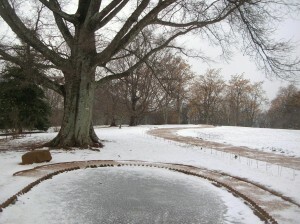 The fish pond is covered in ice. Fish caught in neighboring streams were kept alive until needed for the table. 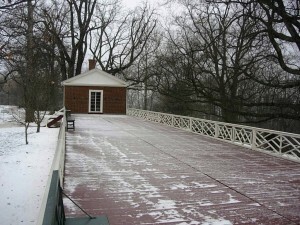 The Garden Pavilion, favored by Jefferson as a quiet and peaceful place to read in the cool of the evening, was toppled by several windstorms following his death and was restored in 1984. 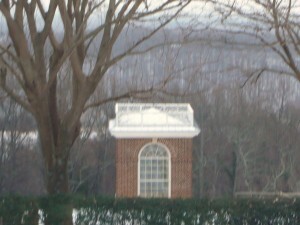 The south pavilion was called the “outchamber” by Jefferson. 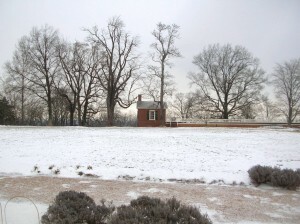 Thomas and Martha originally lived in this. 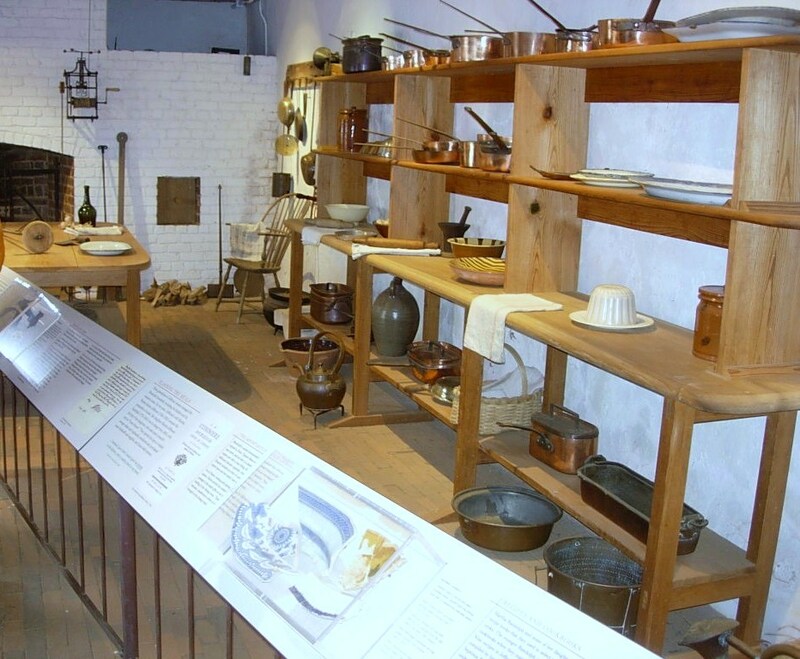 The lower story was at first a kitchen until it was later converted to a laundry (1808). 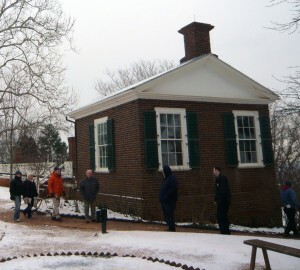 In about 1818, the laundry was moved to the North Pavilion as it was closer to a natural spring. 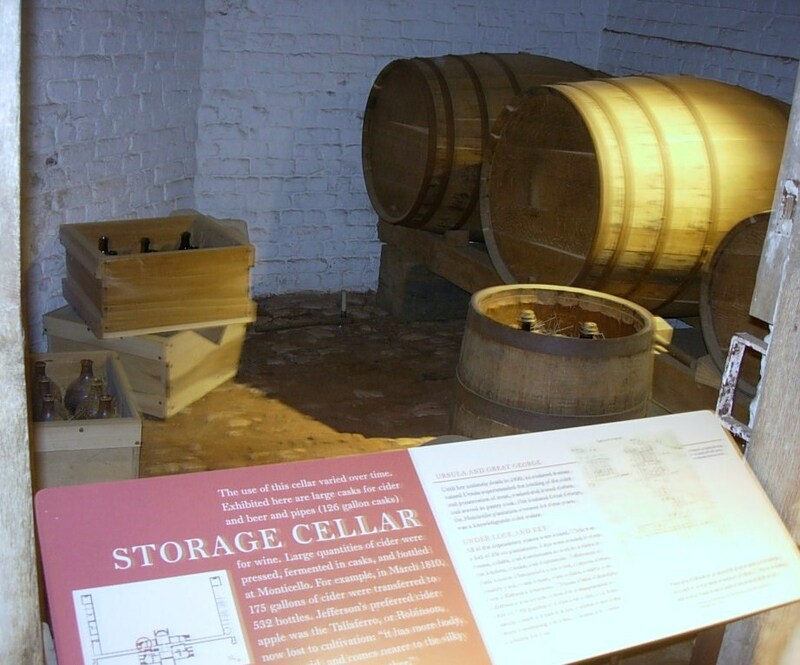 Under the walkway leading to the South Pavilion were several rooms which included a dairy (where milk was stored and butter made) and quarters for the enslaved workers who worked in and around the house. Our tour guide graciously led us to the back of the house and invited us to look around but told us the last shuttle down the hill would be leaving soon. 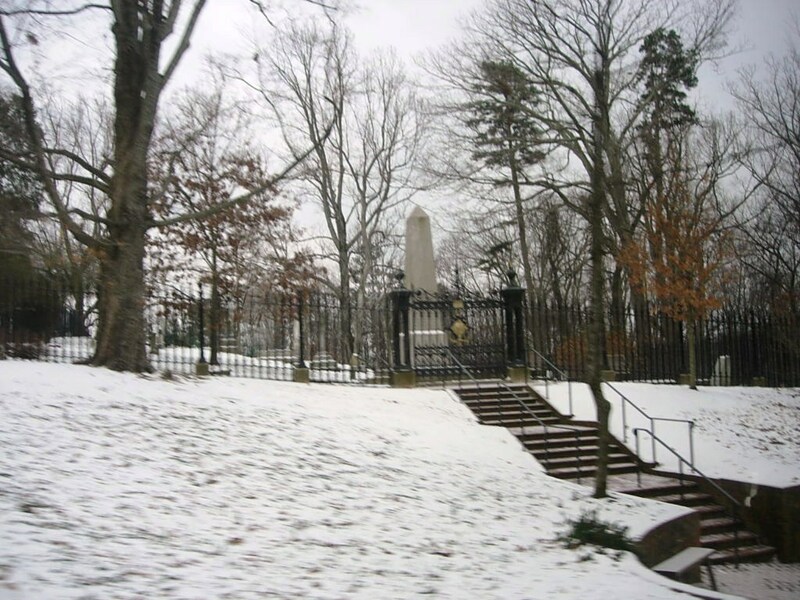 On the way down the hill back out to the visitors center, we were given a brief stop by the Jefferson family graveyard. 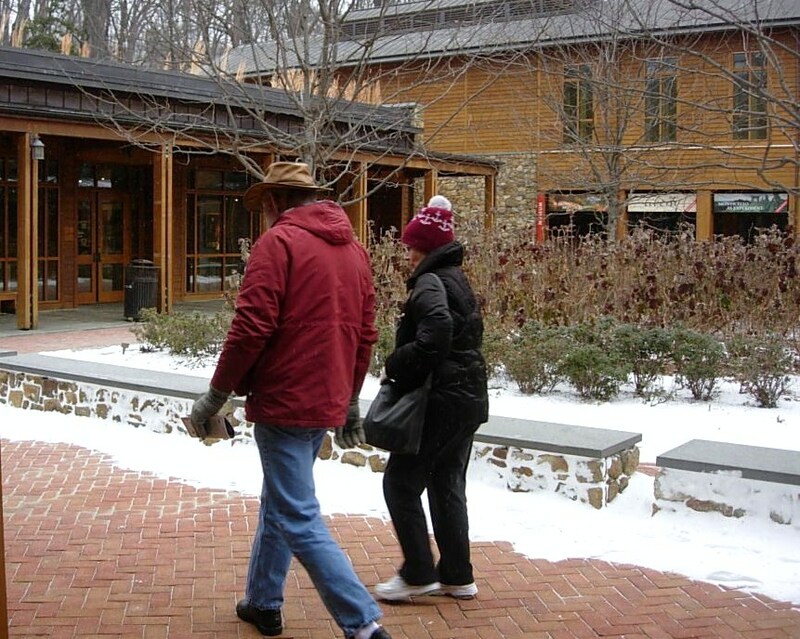 When we reached the visitors’ center, everything was locked up so no gift shop or looking around a bit further. 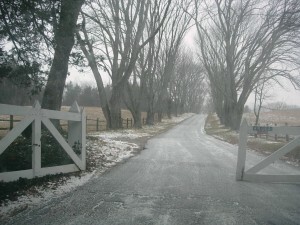 It was back to the car to move along so they could close the gates. 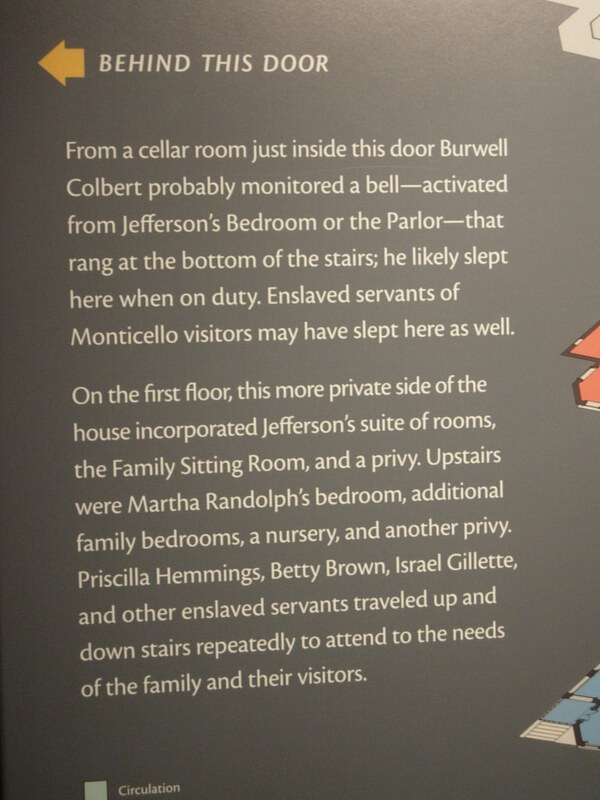 In fairness to the folks at Monticello, we need to relate a bit more of the story. Yes, their website had said they would be open regular hours and the forecast was for slippery roads coming down off the hill but that was the same forecast they had when they announced they would be open all day. No one was rude but you could sense that the folks who worked there were concerned about getting safely home and we were what stood between them and being on their way. When we got home, we sent an email expressing a concern that the daily update of the website could stand a reevaluation of policy. They agreed and said they would be looking into that. 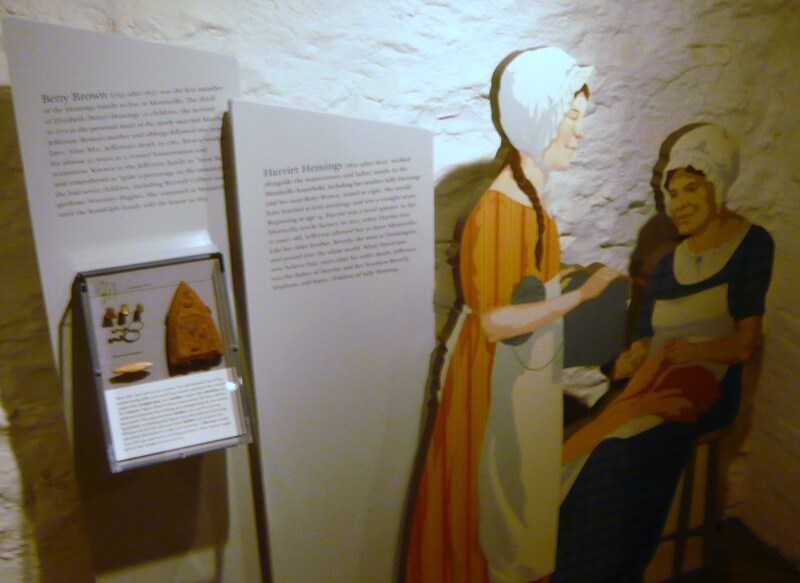 They also sent us a set of tickets to be used for another day and a nice book from their gift shop. It’s often said that the true measure of customer service and graciousness is how you handle an issue, rather than a perfect record of never having an issue. They handled the recovery well. 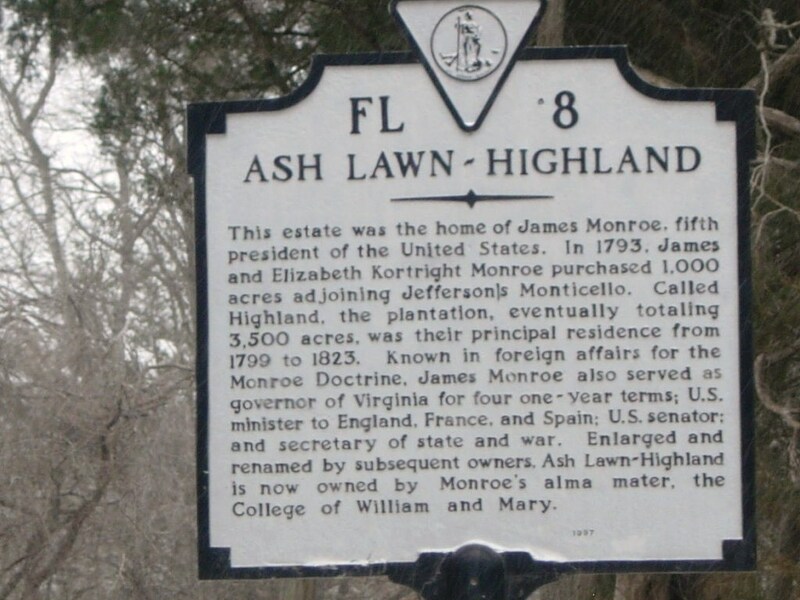 After we left Monticello, we drove over to see nearby Ash Lawn, the estate of President John Monroe, owned and operated by his alma mater, the College of William and Mary. Alas, they were also closed due to the weather but we did manage to get a couple of pictures. 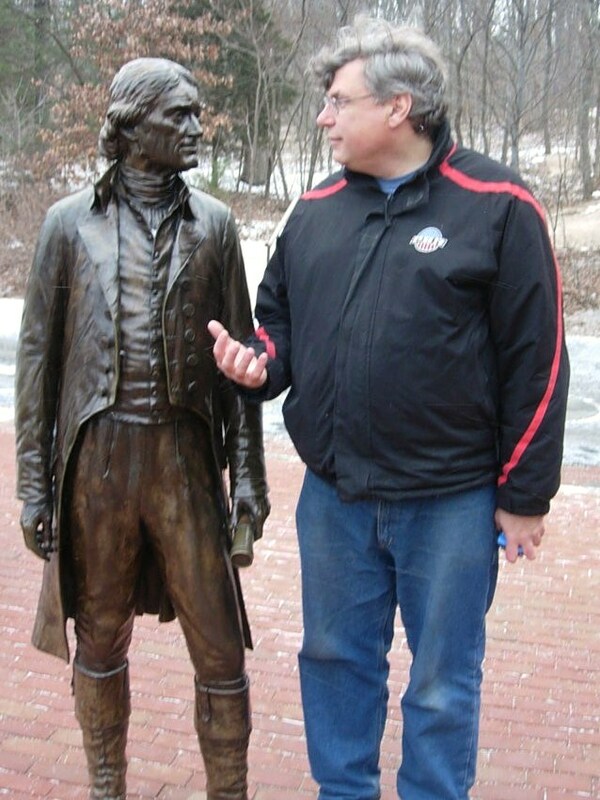 Bit of trivia, Virginia’s governor now serves for one five year term. 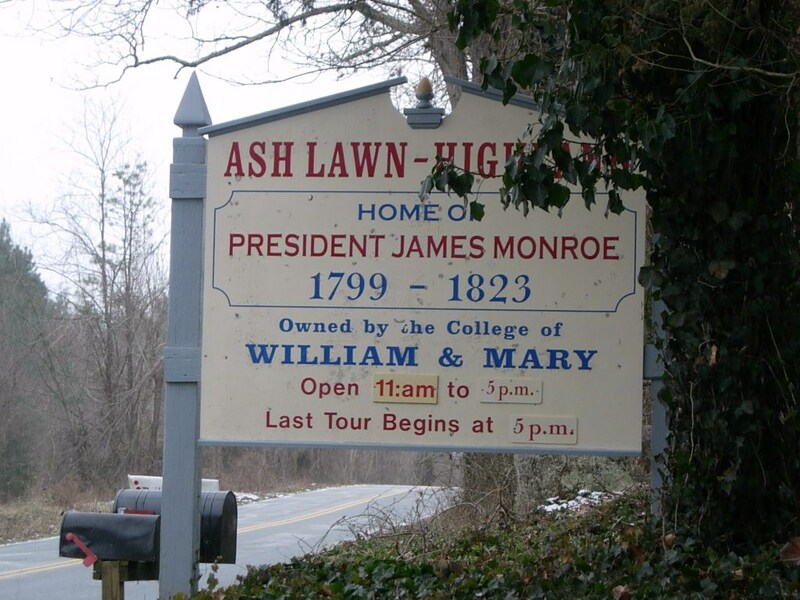 We’ll have to save Ash Lawn for another day. 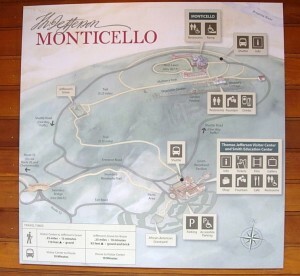 Perhaps an earlier start will get us to Montpelier as well. And so we headed for home but we had skipped lunch and were all getting a bit hungry. 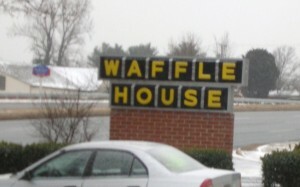 In the course of seeking a restaurant that suited all, it became known that Father Steve HAD NEVER EATEN AT A WAFFLE HOUSE!!! So we remedied that. There’s something very, very wrong with this sign. Do you know what it is? After food, it really was back to the house with a stop at Wawa (somewhere else Steve had never been). The Uno Championshp Series continued well into the night! 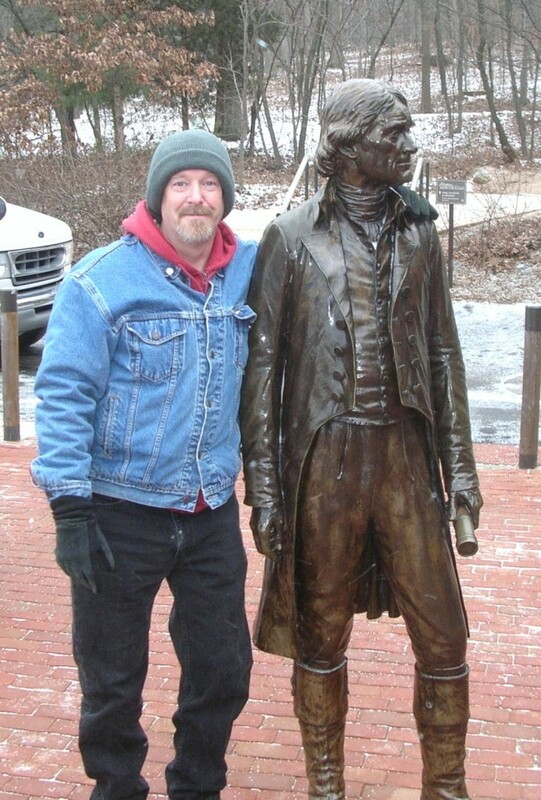 This entry was posted in Capital area, Uncategorized and tagged family, friends, happy tracks, memorial, statue, travel by Keith. Bookmark the permalink.